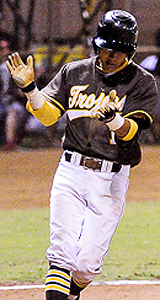 The more at stake, the better Ian Kahaloa played and pitched. 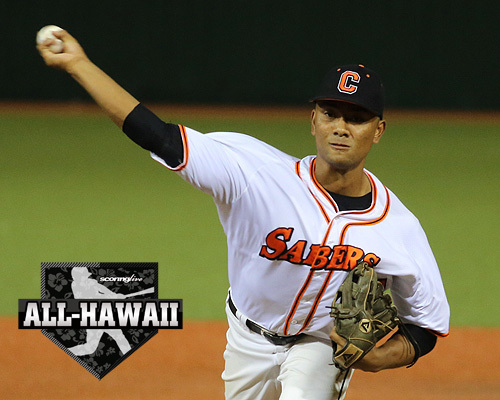 The Campbell High senior right-handed pitcher/designated hitter pitched his finest when it mattered most, making him the ScoringLive All-Hawaii Division I Baseball Player of the Year. Sure, he was credited with a combined no-hitter to open the Oahu Interscholastic Association Western Division regular season in an 8-0 win against Waianae. He threw the first six, but with the game secured, sophomore Markus Ramos threw a perfect seventh to preserve the no-hitter. But basically, Kahaloa was saved for the crucial matchups, usually against the opponents' aces. Two weeks after no-hitting Waianae, Kahaloa won a duel with Leilehua ace Trayson Kubo, an All-Hawaii second-team selection. 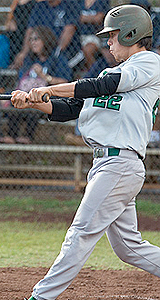 Kahaloa fired a complete-game one-hitter, striking out 13 while walking one in a 3-0 win at Wahiawa's Howard Oda Field. Ten 10 days later, Kahaloa was called again, this time to face divisional rival Mililani and it's ace, Micah Chinen, an All-Hawaii first-team selection. 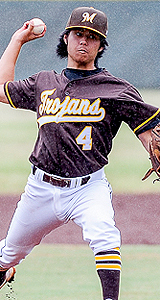 Kahaloa nursed a 1-0 lead until and Trojans scored an unearned run to tie the game in the bottom of the seventh in a battle the Sabers eventually lost in the eighth. He went seven innings, striking out 14 and walking one, while scattering six hits in his only no-decision. 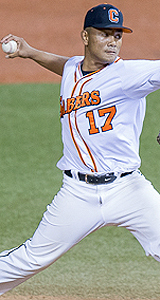 Eighteen days later, the Sabers needed a win to clinch the top seed in the West for the 12-team OIA tournament. Kahaloa tossed his second complete-game one hitter to beat Pearl City, 4-0. He wasn't as sharp, striking out seven and walking a season-high two. They would be the last walks he allowed the rest of the season. Ten days later, thanks to a late rally, Kahaloa beat Mililani, 4-3. He allowed a season-high three runs, albeit all were unearned. 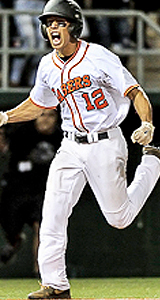 Still, he struck out 10 without allowing a walk, as the Sabers captured their third consecutive OIA title. Thirteen days later, on the biggest stage of the season in the semifinals of the Wally Yonamine Foundation Division I state tournament, Kahaloa and Kamehameha's Codie Paiva, the All-Hawaii third baseman for the second year in a row who also pitches, engaged in an epic duel. Ten innings later, Kahaloa emerged the winner, allowing the only earned run of the season in 44 innings, 61 when you count preseason, and five hits. He struck out a season-high 15 against no walks. The next day, his Sabers were state champions for the first time since 1978. "He has good stuff, obviously," Sabers' coach Rory Pico said, "but his ability to let things go. His demeanor is kind of on the reserve side. He doesn't get overly emotional. I don't think not getting calls, or errors, I don't think (they) get to him. He tries to stay even keel, I think he does that very well. He doesn't get over zealous, over anything." Kahaloa's poise carried over to those around him. "When the defense sees that on the mound, they think, ‘We're OK. We'll keep grinding,'" Pico added. Yet, as valuable he was to his team, Kahaloa made minimal appearances. There were seven other pitchers in the state who pitched more innings during the regular season and postseason. Only three other pitchers posted more wins, but none had a microscopic earned run average of 0.16, which led the state (minimum innings being equal to the number of games a team played). He led the state with 72 strikeouts, while allowing only four walks. But Kahaloa was more than a pitching prodigy. He was an equal threat at the plate. Batting third or fourth in the order, he led the state with a .520 batting average. His 15 RBI were tied for third. He tied for the state lead in doubles (6) and triples (3). Kahaloa, who drew national attention at an Arizona showcase in the fall because of his mid-90 mph fastball and superb command, is expected to be drafted in the first five rounds of Major League Baseball First-Year Player Draft June 8 to 10. Teammates joining Kahaloa on the All-Hawaii first team include pitcher Kila Kapihe, first baseman Dorrien Villanueva-Hermosura, outfielder Dewayne Sprinkel and utility Keola Himan (outfielder, third baseman, pitcher). 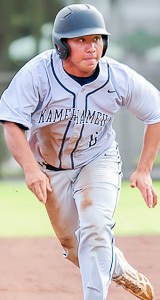 Narrowly missing first-team status was outfielder Blayze Arcano-Llacuna, a second-team selection. At 5-feet-8, Kapihe, who has thrown in the low 90-mph range, might have been overshadowed by 6-1 Kahaloa, who drew droves of pro scouts to his games. 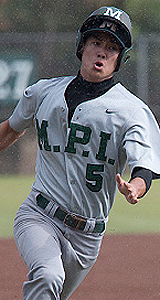 Kapihe was a second-team selection at third base last year. 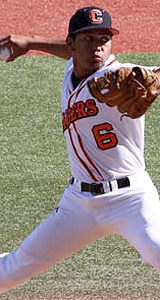 Kapihe had 39 strikeouts to eight walks in 31 innings with a 1.13 ERA. 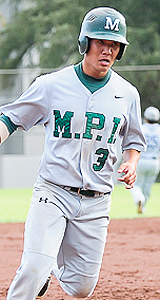 State runners-up Mid-Pacific Institute landed three first-team selections: catcher Noah Shackles, second baseman Jacob Maekawa and shortstop Tyler Yamaguchi. Mililani also had three selections in pitcher Micah Chinen, outfielder Kaimana Souza-Paaluhi and designated hitter Ryan Kono. 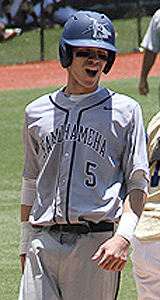 Kamehameha had two picks in third baseman Paiva and outfielder Matt Yokota. Kahaloa, Villanueva and Paiva are repeat first-team selections from last year. In his 12th season, Rory Pico guided the Sabers to their first state crown since 1978. His team made its fourth consecutive state appearance. 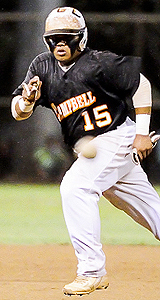 In 2012, Campbell lost a play-in game at Hilo. But the Sabers finished third the next two seasons, losing heart-breaking and close games to eventual state champions Mid-Pacific in 2013 and Saint Louis in 2014. Though blessed with the best pitching staff in the state and at most times, at least eight returning starters on the field, Pico prepared his team for the long haul. There are few softies in the OIA West - four of the last five tournament championships involved a West team - but Pico found ways to solidify his team's depth and prepare for the future. He gave two starts to sophomore Markus Ramos, who has touched 88 mph this season. Pico also gave a start to Keola Himan to assure he logged some innings because the Ian Kahaloa, Kila Kapihe and Dorrien Villanueva-Hermosura were capable of finishing their starts. Moreover, Pico monitored his pitchers. Because of the staff's depth, he was able to give his starting pitchers more than adequate rest between starts, costing his starters potential starts and a chance to enhance their stats. That is why even after Kahaloa pitched a 10-inning complete-game win in the state semifinals, there were still seven other pitchers who threw more cumulative innings. David Perreira (pitchers and catchers), who coached softball to a 2010 state title. Wayne Nagamine (infielders/first base coach).